Even though the unofficial start of summer doesn't begin for another three and a half weeks (Memorial Day) and the official start of summer doesn't begin for another month and a half (summer solstice); in Hollywood, summer starts this weekend! This is the time of year where movies become more loud, dumb, and silly (although discerning movie goers can still find loud, dumb, and silly movies throughout the rest of the year, if they know where to look). In conjunction with the start of the summer movie season, this Saturday is Free Comic Book Day! And Sunday, May 4th is Star Wars Day (as in "May the 4th be with you"). We know that eventually the meek shall inherit the earth, until then it looks like the geek shall care for it. So it is with great pain that I confess that I am not looking forward to this summer's cinematic offerings all that much. Perhaps it's because the best summer movie of 2014 came out a month ago* or perhaps it's because I'm growing up (nah), but I doubt I'll get out to the theater more than two or three times this summer. Please help me out, what should I be excited for? **No, just joking, I just wanted to get a rise out of my good cartooning buddy, Kevin. The best summer movie of 2014 was Captain America 2. 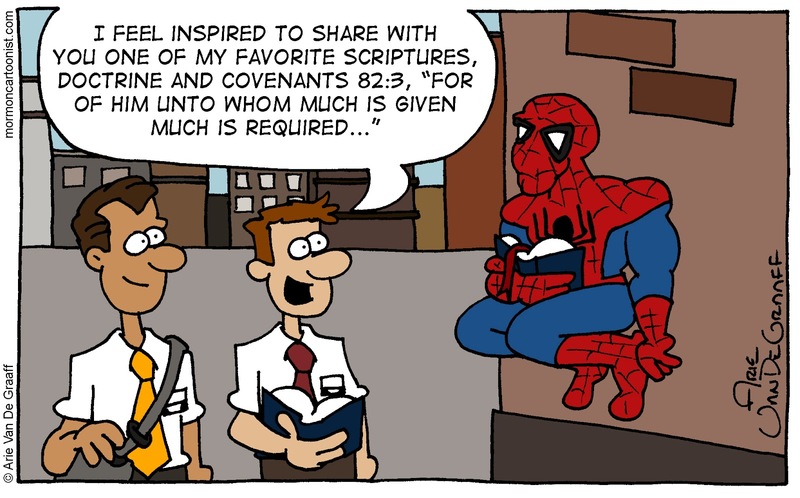 The scripture in the gag has reference to something Spider-Man's Uncle Ben told him that kind of became his mantra throughout his crime-fighting career: "With great power comes great responsibility." I agree with you that this is an off year for movies, not that many I am really looking forward to seeing. Next year will have some pretty good movies coming out. What about the new X-men movie? That is one of the best story lines in comic book history. Also the next planet of the apes movie? I am looking forward to Guardians of the Galaxy, it looks funny. And how could you be excited for Pacific Rim but not Godzilla? There are plenty of movies to be exited for this year. You're right, I'm excited for X-Men and Guardians of the Galaxy. I'm on the fence with Planet of the Apes (although the first one was better than it had any right to be), but it is precisely because of Pacific Rim that I'm not excited for Godzilla. Thanks, Joel, I'm feeling better about the summer already. Alright, David. I'll wait to hear from you before putting money down for a ticket, though. Here's my question. Do you receive inspiration for your comics WHILE reading the scriptures? 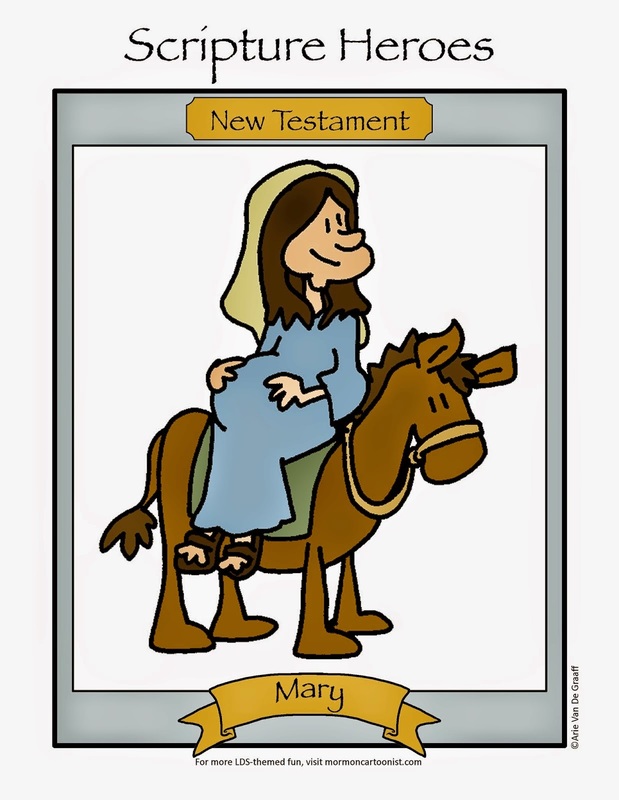 Or do you think of a comic idea and THEN make a scriptural connection? Your Spiderman to D&C 82:3 connection is impressive! I don't remember having many comic ideas while reading the scriptures. Most of the jokes come while brainstorming topics. Great question! A follow-up to Kelsey's question: When do you have time to read the scriptures? Somehow I squeeze it in.